Gun owners in California finally have a point in their corner. However, there’s a long way to go. California’s war on gun rights is enormous. Also, it won’t stop. Still, at least there is a little reprieve. 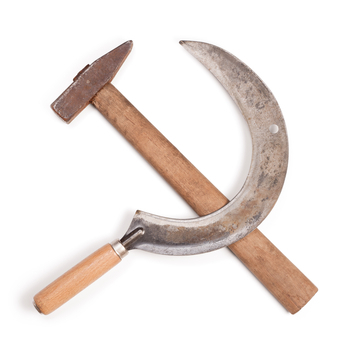 Hammer and sickle isolated on white background. With clipping path. an on high capacity magazines. The San Diego-based judge’s ruling states that the law is likely unconstitutional as it violates a portion of the Second Amendment. The law currently bans magazines holding more than ten rounds of ammo. The law is temporarily blocked after a motion by the CA Rifle and Pistol Association. Furthermore, many law enforcement officers spoke out against the new ruling. In the rural parts of the state, it would be nearly unenforceable as written. The state said it would fight back. Attorney General Xavier Becerra defended Proposition 63. Considering CA’s track record on basic individual and property rights, gun owners have a long fight ahead of them. Now the case is likely headed to the Federal Court of Appeals. The 9th Circuit is easily the farthest left. Their future ruling is obvious. Beyond this, it is likely that the case will head to the Supreme Court in the next several years. Gun rulings changed with Justice Neil Gorsuch on the court. A strict textualist, he shifts the court. Furthermore, the court has been friendly to 2nd Amendment cases. The Heller v. DC decision is a great example. Also, CA will pour a lot of resources into the fight. After the prelim injunction, the appeals court will reinstate the law. Then we see a long, drawn-out battle over the basic human rights trampled in California. Good luck to all of the law abiding gun owners in the state. In conclusion, don’t throw away those 30 round banana clips yet!